There have been numerous articles about mobile technologies and their use by librarians. This semester, I plan to put some of my reading into practice by using an iPad for mobile reference in a study center for non-traditional students. I thought it might be of interest to share a few sources on the subject of iPads and its uses for mobile librarianship. Certainly, other similar-type tablets could be used in much the same way. Please take a look a the brief list below of some of the sources I have collected and read. 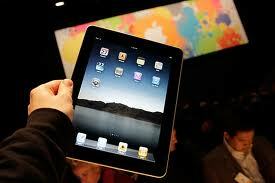 Has anyone used an iPad or a similar tablet as a mobile-reference/librarian tool? If so, would you care to share your thoughts/experiences? If you have not used such a tablet device for mobile library purposes, what do you think of the usefulness and practicality of the idea in your particular library setting? I am really thinking about getting a tablet. They are so convenient. We have gone to 1:1 iPads this year (that’s one of my posts above) but last year I had one mobile iPad to use as a librarian. I found it really helpful when working with classes because I could move around the library/campus and be able to show people something I was explaining.